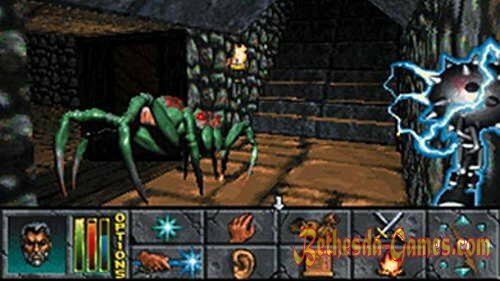 Events in the game Daggerfall, as well as in other games of this series, developed on the continent of Tamriel, where Daggerfall - one of the many provinces. Travelling on it greatly complicates a lot of enemies and the most powerful of them - is the Daedra. 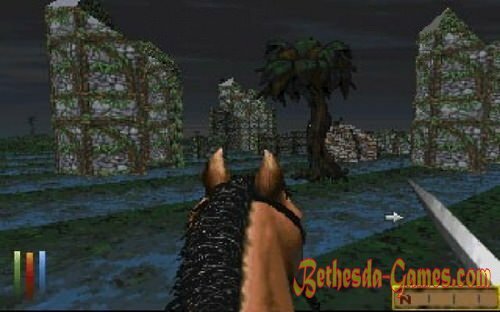 This is the biggest game of the series Elder Scrolls, largest caves, villages and towns in Daggerfall them more than fifteen thousand. 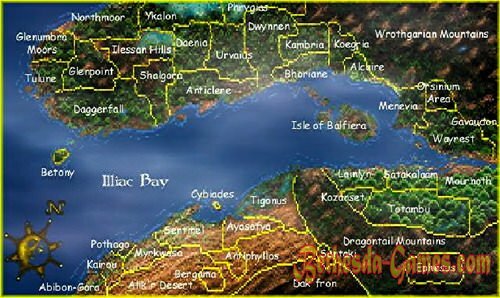 Map of the game takes one hundred and sixty one thousand square kilometers to explore. 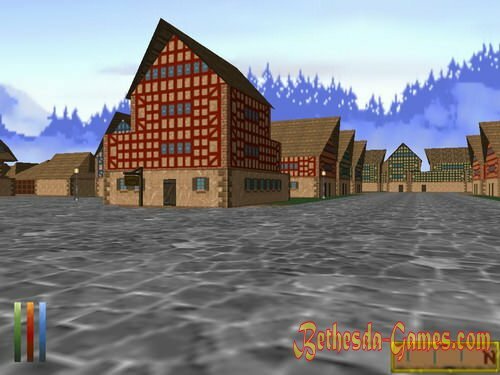 If you compare it to other games such as Morrowind's play area only twenty-six square kilometers, about forty-two Oblivion, Skyrim and thirty square kilometers. In help players have developed a special auto-map for passing the ancient ruins and dungeons. The hero in the game must necessarily visit about eight countries, although there are present forty seven areas. After this game, the developers decided to reduce the number of locations, but make it more detailed and unique, quite unlike each other. Plot. 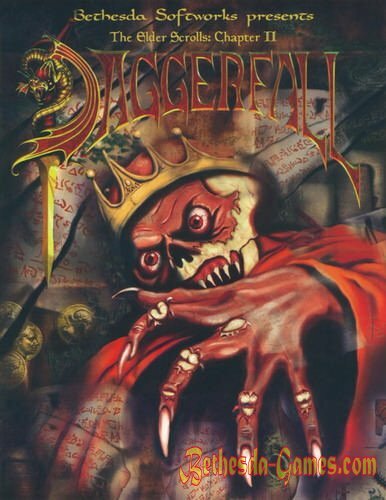 The hero of the game goes to Daggerfall on behalf of the Emperor, who gives him two orders - a release from earthly shackles soul of the deceased King Lysandus and learn what happened to the letter which he sent to spy Blades Daggerfall. In a letter to the Emperor wrote that Nulfage, long known where the artifact -Mantella energy source. He needed to revive Numidium, huge iron golem, with the help of Tiber Septim to create an empire. He writes that the Blades made this woman reveal the whereabouts of a mysterious artifact and repaired Numidium. By chance the letter falls into the hands of the orc Gortvorgu. With this letter, he shares with the leader of the Necromancers, Mannimarco (aka King of Hearts). At the same time Underking that destroyed the first time Numidium, reborn in a crypt in the depths of the High Rock and restored. The hero struggles to perform these two tasks. It is his duty to punish the murderer Lysandus rest his soul and find the Mantella. Endings of Daggerfall, there are only six. 1. The hero can activate Mantella himself, having totem (a device that is capable of controlling Numidium) will lose control, killing the hero, and he will die at the hands of the troops of the Empire. 2. If the hero Mantella give into the hands of the King of the Underworld, then it will absorb his power and will go into eternal rest, creating around itself a huge area, freed from magic. 3. If Numidium get Gotvorgu, he uses it to conquer the Empire and the Kings Bay Illiak other provinces. Then turn up Underking, once and for all destroy Numidium, sacrificing his life. A Gortvorg create the Kingdom of orcs. 4. Winning Blades will help them fix the first Numidium and apply it to enslave the orcs and all the Kingdoms of the bay. Again, combining all the provinces of Tamriel. 5. If the victory will be for how or whether from Kings Bay, he will win Numidium other Kings before Underking time to destroy it himself. 6. If Mannimarco get Mantell, he uses it to make himself a god.